While it actually suited Seamus Callanan last year, he says the Premier county have learned going forward. WITH CLUB-ONLY MONTH entering full swing once again, the divide in opinion is evident more than ever. The GAA’s policy of designating April as a month solely for club action has had no shortage of mixed opinion thrown at it with Tipperary hurling manager Liam Sheedy recently ‘calling it straight’ that ’22 of the 32 counties absolutely ignored (the club month)’ in 2018. Wexford’s Lee Chin told The42 this week that he supports the idea but he can understand the frustrations that managers hold towards it, while Dublin defender Eoghan O’Donnell revealed that he is a big fan of the ‘change of pace’. At the same Bord Gáis Energy GAA Announcement in Croke Park yesterday, it was interesting to hear Premier captain Seamus Callanan’s thoughts. Many believe that the hectic run of games hurt Tipperary last year. Michael Ryan was perhaps hampered for their Munster championship campaign by the busy club schedule that players underwent in April 2018. 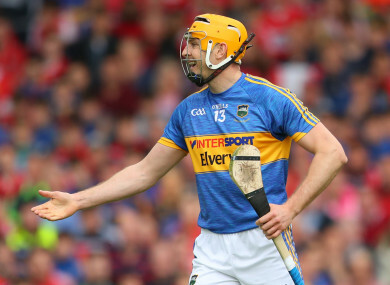 While two-time All-Ireland winner Callanan believes that there have been learnings from last year, he feels that he actually benefited from the hectic schedule as he returned from injury. A back problem saw him miss the entire National Hurling League campaign, so the serious amounts of minutes on the pitch helped him. “Last year now having the club games probably suited myself because I was only back from injury,” he said. “I needed them whereas some lads were playing three club games after coming off a long league campaign as well. Maybe they didn’t need them as much as I did. I suppose on my own experience, having them club games was welcomed. “Look, I can see how it is. It’s very demanding for players to play a full league — we got to the final last year so we had the extra games, then the club games and you’re straight into championship. It is hard like. Physically, he’s in peak condition at the minute and credits the team’s strength and conditioning coach and physios for that, but he does have to keep on top of it himself. And all in all, the Drom-Inch man is feeling much more positive about where he, and his side, are at at the minute compared to this time last year. “Absolutely, yeah. A full pre-season done, league campaign in and lots of matches there. Definitely feeling positive about the injury and have that put to the back of my mind now. That’s behind me now, I can move on. “The big thing now is to be able to perform. To be able to train every night is a huge thing. Some people maybe don’t value the fact of actually being able to train. He’ll hope they can do just that in the Munster championship. The 30-year-old refers back to the fact that the 2016 All-Ireland champions crashed out prematurely last year, and the disappointment associated with that, but it will only drive them on. All focus will soon be on Páirc Uí Chaoimh on 12 May, with the excitement shining through — with zero concerns around the surface of the pitch — as Tipp hope to get off to a positive start against Cork. Email “'It's very demanding,' but Tipperary captain happy to follow busy schedule”. Feedback on “'It's very demanding,' but Tipperary captain happy to follow busy schedule”.